Love it….LOL!! You brightened my day!! Dang, they must number the aisles differently out here. I haven’t found the money trees yet, either! Let me know if you do and I’ll plan a road trip. A bit gamey? But the curds and sauce would cover it up . . .
LOL! Yep, hard to go wrong with curds and sauce! With the way your mind runs it’s no wonder Aydan can get herself into situations of the magnitude they are. Good news on the new book…waiting anxiously. By the way, have you ever asked a child where french fries came from? I haven’t – I don’t know any young children at the moment, but I’m sure if a person was to poll a Grade One or Two class their answers would be enlightening… and probably hilarious! You know two people are meant for each other when they can finish each other’s conspiracy theories, 😂. Thanks for another laugh. I’m thinking it could be simultaneously symbiotic DNA re-matching due to the subconscious ingestion of genetically engineered growth hormones found in rutabagas and collard greens. Those dirty dastards! Or, it could be intracranial psycho-mutation caused by atmospheric nuclear testing from the ‘fifties. That was the cause of everything else for the next fifty years, so why would it not be, right? Or, it could be colloidal neutron wave beat-frequency oscillation from listening to Janis Joplin through the same headphone jack of your 8-track player. P.S. Something nice happens to our intrepid heroine? EXCELLENT!! Gad, I can hardly wait for Book 14! Just think of that. BOOK FOURTEEN!! What a great ride this is! And no pressure, but, well, hurry every chance you get, okay? Good for you – slow is good. Slow cooking makes the tastiest stews! 😉 I’m hurrying every chance I get, I promise! Yep, the logging trucks are merely a clever decoy. The fries are harvested by Big Feet (plural of Big Foot?) during the day. After all, who’s around to see them, right? They place the harvest in those big, unexplained, fenced-in areas with the concertina razor wire *pointing in. * All the fries are hauled to market at night by those black helicopters that everybody knows about…but nobody acknowledges. The razor wire supports on the fences point inward to keep the fries from escaping. Most escape attempts are foiled, either by the concertina or by the orbiting gunships whose crews are under orders to take no prisoners. One long burst with their Gatling cannons and…potato salad. The ones that actually clear the fence are captured and sold to McDonald’s. You can tell, because the razor wire has peeled them completely. The ‘good and obedient’ fries that did not try to escape still have a bit of peel on them here and there. Those go to regular restaurants and supermarkets. I mean, it’s SO obvious after you actually learn the government’s dirty little secrets, right? Wait…(sniff, sniff, sniff). What’s that I smell? A conspiracy? Yeah, probably. Either that, or it’s just a bit of fiction quick-fried in peanut oil. You are both nuts but I love it. Couldn’t agree more about kids not knowing about potatoes being the start of French fries. and that yellow stuff on burgers. What?!? Fries don’t grow on trees? I’m shocked. In other news, a woman in California sued the state for failing to protect hikers from big foot. Seriously, she says she saw big foot in the forest and said that park rangers did nothing to protect her. 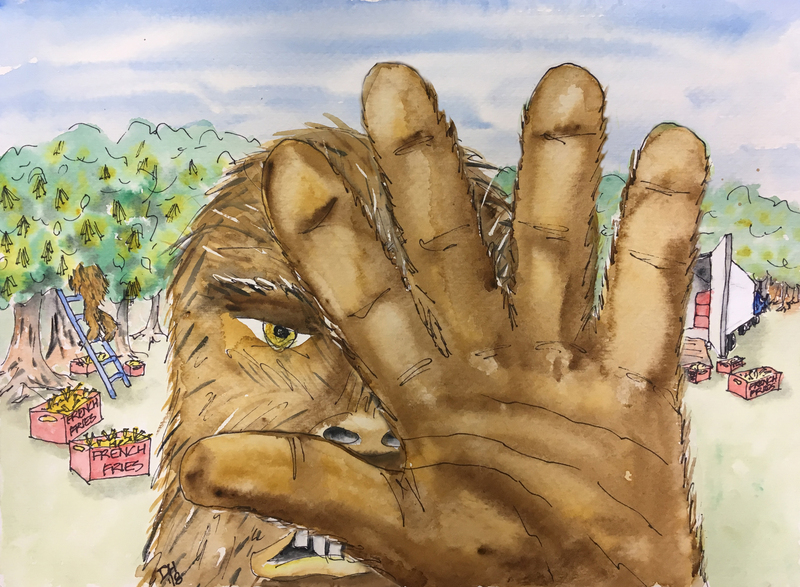 The only conclusion: Sasquatches are now in control of the park service – what next? Congress? OMG, she must have been perilously close to the french-fry trees. Lucky she didn’t get “vanished”. Now I get it, missed that before, sorry – Sasquatchs guard the french-fry trees. Got it! Thanks for the clarification! Makes much more sense now.